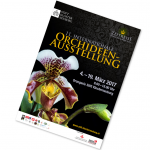 Already for the 11th time, the Orangery of Klosterneuburg Monastery presents its International Orchid Show in 2017. In a heatable show marquee in the convent garden and in the Orangery, fascinating presentations and flower arrangements by renowned exhibitors are on display for our visitors. orchids, the exhibition reveals fascinating insights into the royal families of Europe. With an area of 2,000 m2, the orchid show is the largest of its kind in Austria. In addition to the exhibition in the Orangery, individual advice is offered by experts in the show marquee, where various plants, accessories and decorative items related to the orchid are for sale. Look forward to being delighted by the great variety of orchid flowers and rare plants, combined with special events and package offers for groups. daily: 9 a.m. – 6 p.m. Combination Ticket 1 Seniors, handicapped, etc. Please note that only punctually registered groups can be considered. We thank you for your understanding. Long night of the Orchid until 10 p.m.